Native of Japan, having a well known jazz pianist, Hiroshi Ikeda as father, and professional classical singer as mother, Ms. Ikeda started piano at her age of 3, and violin at 4. She received Bachelor and Master degrees from Osaka College of Music, Japan, where she intensively studied classical violin with Tomotada Soh and Takako Murata. Her classical studies extended to master classes in Internationales Jugend - Festspieltreffen Bayreuth (Germany), Aspen Music School, The Bowdoin International Music Festival (USA), Cupra Music Festival (Italy), Tring (UK), Stow (UK), and Courchevel Music Alp (France). 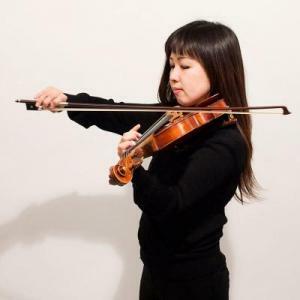 While Ms. Ikeda was very busy performing with orchestras as well as solo performances and supporting musician for TV shows, concerts, and theaters in Japan, she was also busy teaching at Osaka College of Music, Koyo Conservatory, and a few other schools. She was strictly trained classically by her mother, while she had been familiar with jazz music influenced by her father. When she finished her undergraduate study, she started to take jazz gigs, and became more interested in that direction. Later she started to take lessons with renowned alto saxophonist, Randall Conners. She is now studying performance with Matt Glaser, Rob Thomas and Christian Howes, and studying composition with Bob Pilkington and a 3 time Grammy awarded Eugene Friesen at Berklee College of Music in Boston as a scholarship student. She has won 2011 The Next Big String Thing Competition. In 2010, she received the String Department Chair Award for her distinction in performance. She has won 2011 Tune Contest, presented by String Without Boundaries, Pittsburgh, PA.
Ms. Ikeda has performed in concerts, master classes and clinics with Ron Carter, Jean-Luc Ponty, Eugene Friesen, Mark O'Connor, Regina Carter and performed in venues such as The Kennedy Center in Wasington D.C., Berklee Performance Center in Boston, Cathedral of St. John the Divine in New York to name a few. She has also been busy performing in local jazz clubs and concert halls as a regular member of A-NO-NE Ensemble, Racha Fora, and Video Game Orchestra.